Recorded in: Stereo Length: 1 Hours 4 Mins. Jenny Lin’s adventurous programming efforts turn to Igor Stravinsky, whose smaller-scale works tend to escape the spotlight. Yet Stravinsky’s solo piano is packed with as much theatricality as his music for larger and louder forces. From instant to instant, this theater can be comedic, raucous, rustic — and then suddenly intimate and moving. 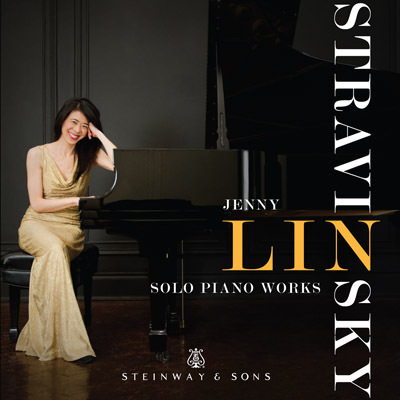 This is the third release on the Steinway label from Jenny Lin, described as "...surely one of the most interesting pianists in America right now" by the Washington Post. Most of Stravinsky's important solo piano works are included on this disc, as well as Agosti's rarely recorded arrangement of the Firebird Suite. Jenny Lin's first release on the Steinway & Sons label was Read more Silent Music, chosen as one of the best albums of the year by the New York Times in 2011. Her 2012 release, Get Happy, was described by MusicWeb as "...an outright joy. It’s something every piano collection should have." "A master pianist, Jenny Lin’s signature blend of technical mastery and grace is combined with Stravinsky’s distinct musical sensibilities on several of his smaller scale opuses for solo piano. Lin produces the magic inherent in Stravinsky's oeuvre during her performances of his 1924 Piano Sonata, his Four Etudes (1908) and his Ragtime for 11 instruments. Each piece is a masterful sensory experience that reveals a well-thought-out interpretation that is suitable for the composer’s intentions. Jenny Lin was first introduced to Stravinsky for piano through the late Italian pianist and teacher Guido Agosti who had presented her with his Firebird Suite 1928 transcription. To conclude her program, Lin performs Agosti’s arrangement of three movements from the suite. She skillfully plays each movement with the polyrhythms, color and impressiveness heard in the full Stravinsky masterpiece. Overall, Ms. Lin offers her listeners an expressive, beautifully arranged program that will delight you for years to come." Stravinsky’s piano works, slender as they are, have been very well served on disc, starting with Aleck Karis on Bridge and continuing with Victor Sangiorgio on Naxos. Add Jenny Lin to the list of first-rate Stravinsky interpreters. Each of these discs has a slightly different program, adding musical “meat” to the major works: the Piano Sonata of 1924, the Serenade in A , the Four Etudes, and Piano-Rag Music. Combined, these only comprise about 30 minutes of playing time. In order to bring this disc up to 64 minutes, Lin adds a selection of transcriptions, some of which are familiar (the Polka and Valse from the Second Suite for Small Orchestra, the Circus Polka, and Ragtime), and some of which are both rare and interesting. There’s a bit of the Prologue from Boris Godunov, a couple of sketches for a late sonata, and most interesting, a transcription of three movements from the Firebird Suite (Danse infernale, Berceuse, and Finale) by Lin’s teacher Guido Agosti, sanctioned by the composer. This latter is a real find, and a nice change of pace from the otherwise inevitable Three Movements from Petrushka. It’s full of pianistic fireworks and Lin tosses it off with real bravura, albeit with understandably more rhythmic flexibility than we encounter in a typical orchestral performance. The music’s cascades of notes also offer an interesting contrast to the more linear textures characteristic of the Sonata, and to much of the remaining program. In the later, neoclassical works, Lin proves equally adept at providing crisp articulation and lucid textures without letting the music turn cold and mechanical, as it easily can. In short, this is an extremely fine recital, and Lin’s Steinway has been quite beautifully recorded at the Sono Luminus studios in Virginia. There may not be any major works here, but the program has been intelligently assembled and the result is both very refreshing and impossible to criticize. I so enjoyed Jenny Lin’s playing on an earlier CD ( Get Happy, Steinway & Sons 3011) that, when offered a chance to review this disc, I jumped at it. I was not disappointed. Indeed, the only niggling complaint I can make of this disc is that Stravinsky’s Piano Sonata was originally issued on piano rolls (prior to publication of the score). Stravinsky himself presumably therefore endorsed the player piano sound for this work, but the herky-jerky motion it produces is hard for a human pianist to reproduce. Other than that, Lin does full justice to this odd piece, particularly in the second movement where the melody line starts out conventionally but almost immediately turns quirky, with strange chromatic chord changes to kick it along. I was not previously familiar with the early Etudes (1908), but although they date from the time when he was studying with Rimsky-Korsakov, and show it, you can still spot certain Stravinskyan traits, particularly in the almost dizzying display of polyrhythms (not to mention the occasionally strange chromaticisms). Once again, Lin plays this music with her usual bracing energy and headlong enthusiasm. She also does a great job on the better-known Tango (1940) as well as the little-known Polka, Valse, and Piano-Rag Music, the latter from 1919, a year after he wrote his Ragtime for 11 Instruments (played here in a piano transcription by the composer himself). Perhaps due to the lightweight nature of most of this music (even the sonata is not really a serious piece, despite indications of his mature style), there is very much the same feeling to this disc as Lin’s Get Happy CD, which was based on show tunes, but her natural effervescence is perfect for these scores and vice-versa. She attacks this music with a no-holds-barred gaiety that is infectious. The liner notes assure us that, despite “dense texture throughout, there is an abundance of soaring melody lines that are vocal in nature.” Perhaps so, but I know a bushelful of singers (even some modern ones) who would get lost trying to sing this music. It’s so rhythmically complex that they’d have to “count” the beats like dancers doing Le sacre. Nevertheless, strictly as a piano work it’s an absolutely delightful sample from the composer’s neoclassical period, and here, for once, Lin is able to relax her normal drive-ahead enthusiasm and show us how well she can limn a melody as well as how well she can vary both her touch and use of dynamics. The 1942 Circus Polka, composed for a ballet of elephants (!) at the Ringling Brothers and Barnum & Bailey Circus, finds the composer in a particularly whimsical mood, using a snippet of Schubert’s Marche Militaire, and Lin absolutely revels in its quirky humor. Oddly, there also seems to be quirky humor in the very brief Two Sketches of a Sonata (from 1966–67), although to me, personally, the brevity and unfinished nature of the music seemed an odd choice to record. Lin’s recital ends on a quite dashing note as she plays Guido Agosti’s piano transcription of the Firebird Suite, undertaken with the composer’s blessing. The notes say that Lin absolutely hated this piece as a student because it was so difficult and, even now as a mature pianist, “it feels like you need a third hand,” but just listen to the way she dashes it off. I have a feeling that if you looked up the word “panache” in a pictorial dictionary, there would be Lin’s face smiling at you from the page. The highest compliment I can pay Lin is that I really believe that, were he able to hear her play, Stravinsky would be grinning from ear to ear. If you enjoy Stravinsky and/or bravura pianism, this one is a no-brainer. Weighed against the great orchestral scores, Stravinsky's works for solo piano form a minor part of his output. Few works beyond the Three Dances from Petrushka are heard at all frequently and discs entirely devoted to his smaller-scale keyboard works are comparatively rare (I have not heard Martin Jones's highly praised 1996 two-CD survey on Nimbus, nor Giacomo Franci's 2012 Fone disc of almost the entire solo works). Lin demonstrates triumphantly what we — and, not incidentally, her fellow pianists - encounter too infrequently. Stravinsky may have regarded the piano primarily as a percussion instrument but in the early works he has not moved on that far from Mussorgsky, his teacher Rimsky-Korsakov and, in the Four Etudes (1908), Scriabin. It is the complex polyrhythms of the latter work that present the greatest problem for the performer. Lin brings an incisive brilliance to these little masterpieces, as she does to the outer movements of the 1924 Sonata. In the same vein, the four-movement 1925 Serenade, inspired by dance forms, deserves to be better known—'gentle neo-classicism with a wink' (Ben Finane in his excellent booklet). Ragtime is heard in the composer's own transcription (great fun), wittily characterised by Lin, like the other short works here. She concludes with a blazing performance of Guido Agosti's cripplingly difficult 1928 transcription of three movements from The Firebird. Another superbly recorded Steinway disc, and another notable achievement from this gifted and imaginative artist. Period: 20th Century Written: 1924 France Venue: Sono Luminus Studios, Boyce, Virginia Length: 10 Minutes 8 Secs. Period: 20th Century Written: 1908 Russia Venue: Sono Luminus Studios, Boyce, Virginia Length: 8 Minutes 28 Secs. Period: 20th Century Written: 1918 Switzerland Venue: Sono Luminus Studios, Boyce, Virginia Length: 5 Minutes 22 Secs. Period: 20th Century Written: 1940 USA Venue: Sono Luminus Studios, Boyce, Virginia Length: 3 Minutes 31 Secs. Period: 20th Century Written: 1919 Switzerland Venue: Sono Luminus Studios, Boyce, Virginia Length: 3 Minutes 17 Secs. Period: 20th Century Written: 1918 Venue: Sono Luminus Studios, Boyce, Virginia Length: 1 Minutes 32 Secs. Period: 20th Century Written: 1925 France Venue: Sono Luminus Studios, Boyce, Virginia Length: 10 Minutes 26 Secs. Period: 20th Century Written: 1966-1967 Venue: Sono Luminus Studios, Boyce, Virginia Length: 0 Minutes 20 Secs.